The Iraqi political artist has reached global audiences with his thought provoking work, but it hasn’t come easy for the NYU professor. From being locked in a room for 30 days while being shot with paintballs by Internet users, experiencing the water boarding technique first hand and enduring an arduous 24-hour tattoo session to represent the casualties in the Iraq war, including his own brother - pain is a platform that has been covered extensively by Wafaa Bilal. His project, the 3rd Eye has received awe from the global media. 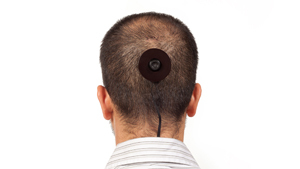 It involves the artist surgically implanting a camera in the back of his head for a year and relaying a still image every minute to the Arab Museum of Modern Art in Qatar. Many wonder why on earth he would involve himself with such a painful procedure, performed not by a doctor but by a tattoo and piercing specialist. Growing up under Saddam’s regime has undoubtedly inspired Wafaa’s engaging and breathtaking work. “I remember in 1991 leaving my home town after being bombarded by Saddam's regime, I saw the rising smoke of the city and I wished I could have captured some of these images. If I had the apparatus to capture the city the pictures would have been very subjective. From that idea I started to think about how the photographer uses that subjectivity when taking images." “I started thinking of the project the 3rd Eye and decided it needed to be part of my body for it to become part of the apparatus, to lose some of the subjectivity but not all of it because that would be impossible, since by choice the camera was placed in the back of my head." “It is extremely painful, not only did I endure the operation under local anaesthesia but also you have to take care of it, half of the skin on the back of my head is now lifted where the magnetic plate is,” explains the artist. Wafaa started to take an interest in art from an early age, but was hindered from pursuing his passion by Saddam’s regime. The artist’s upbringing was hard under the rule of the Saddam. The artist showed great courage when he opposed the regime and rejected to fight in the war with Kuwait, but of course this would seal a grim fate for Wafaa if he were to stay in his home country. The professor has also hooked himself up with GPS so anyone can view his location via the Internet – a direct dig at surveillance in our society. The terrifying experience has undoubtedly shaped the artist into crafting political pieces of art. Wafaa hadn’t been back to Iraq until 2009, the term homesickness takes on a new meaning. Wafaa insists that it would be wrong to neglect his past and create art that purely meets aesthetic needs. Using his art as therapy could explain Wafaa’s kind and mellow demeanour. What could the professor possibly be planning next to carry on shocking the art world?